Fry bacon and red onion together now if you desire a crispier flavour (which frankly we all do). Sift flour, baking powder and salt, then rub butter in until you get those much-desired coarse breadcrumbs. Make a (wishing) well and pour in milk and pumpkin. Cut in with a knife until you get a rough dough. Put on a lightly floured surface and roll out a large rectangle about 2cm thick, cut in half. Put filling on top of one half and sprinkle ¼ cup of the parmesan here. Top with other half of dough and sprinkle other ¼ cup of parmesan and the seeds (and more bacon if you want some on top). 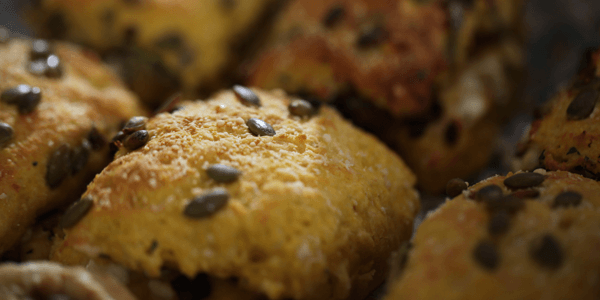 Cut 12 scones and put onto a cold tray and bake for 15 minutes or until golden. Cool on the tray.